Happy Mother’s Day! 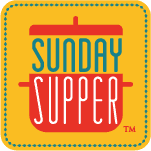 I am super excited to be hosting this week’s #SundaySupper event! Could there be a better way to honor my mother then to be hosting #SundaySupper? I don’t think so! Especially since Sunday Supper was always a time my family came together with my mom making a home cooked meal and my family talking about our week. It was a time none of us ever missed, no swimming or soccer practices, and just time with the family. What is #SundaySupper? It’s a mission started by my new friend Isabel of Family Foodie. Her mission is to bring families around the dinner table to share meals and time together every week. Each week our amazing #SundaySupper group shares a new theme, and this week it’s Mother’s Day! I had a hard time deciding what to make this week. I wanted to make something that my mom really loves but many of those recipes are already on my blog. I went through some of my recipe books and couldn’t find anything. I then started looking through my recipe card boxes and as I was flipping through I spotted it. My recipe for crepes. A little background on these crepes. I took Home Economics cooking classes for several years in junior high and high school and loved it. I used many of the recipes at home to cook for my family. 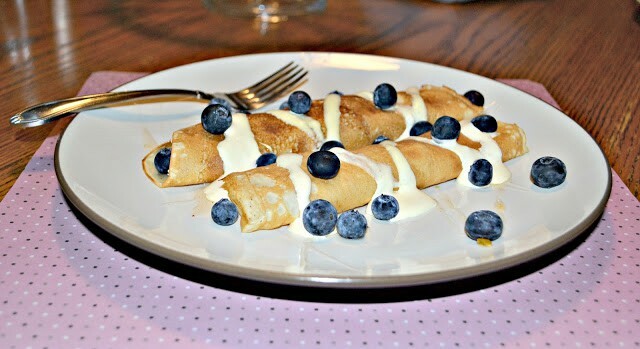 This crepe recipe came from my 10th grade Home Ec. class and it was one of my mom’s favorites. 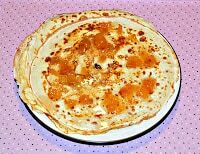 In fact, she still asks me to make crepes for her every once in a while and this recipe is from more then 15 years ago! I didn’t change the crepe recipe at all. Why change something that works? I did change the filling though. As a teenager I always filled the crepes with pie filling and then topped them with Cool Whip. This time I used my homemade peach jam filling, topped it off with vanilla Cool Whip, and then sprinkled them with berries. While my mother wasn’t here when I made them, I can’t wait to make them for her the next time I’m home! 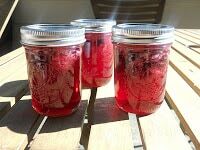 I know she’s going to love them, especially with my homemade jam. 1. In a large bowl combine the flour, sugar, baking powder, and salt. 2. Stir in the milk, butter, vanilla, and eggs. Beat for 1 minute or until smooth. 3. Heat an 8 inch skillet over medium heat. Spray with cooking spray. 4. To make each crepe, pour 1/4 cup of batter into the skillet and immediately rotate the skillet until a thin layer of the batter covers the bottom. 5. Cook until bubbles begin to form and the outer edges turn golden brown. Flip the crepe over and continue cooking on the other side until it is brown as well. Remove from the pan and place on a plate. 6. Repeat with remaining crepes, placing a sheet of waxed paper in between each crepe when stacking. 7. When ready to eat, spread 1-2 tablespoons of jam on one side of the crepe. 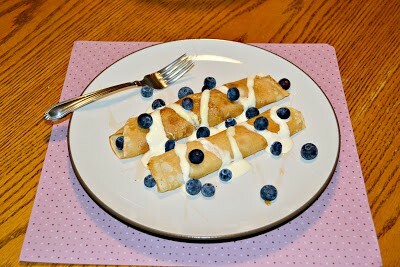 Roll up the crepe, place on a plate, spoon Cool Whip on top of the crepe, and sprinkle with blueberries. Enjoy! 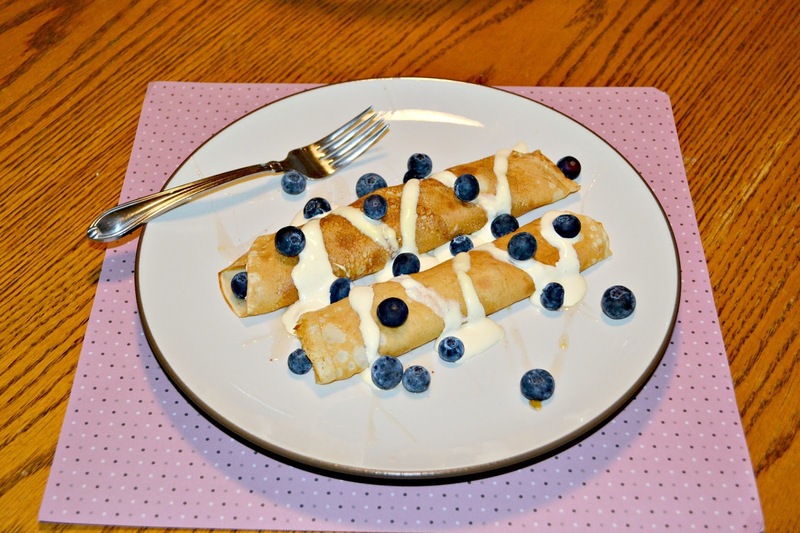 Your crepes are amazing…they truly are one of my mother’s favorite foods too! Thank you so much for hosting this week! I really do need to tackle making crepes. I don’t know why I haven’t made any so far. Yours looks so good and I’m wishing I had those for breakfast right now. I love crepes. Once you get the hang of them they’re fun! Thanks for hosting, Heather! Uhm. Heather. Those look…. amazing! Crepes are so hard for me to make, and I love them so much. Yours are sooo beautiful. Thank you so much for hosting this week – such a great week! Beautiful crepes, and I love the sound of your peach jam! Yum! Your crepes look amazing and so beautiful!!! What a perfect breakfast! Thank you for hosting this week!!! Gorgeous crepes Heather! Love the filling too. Thank you for being a great host this week. Such a beautiful dish, Heather! Crepes are so perfect ad your Mom is one lucky woman! Very pretty crepes…they give me fits sometimes, but maybe I just need the right recipe! These are so pretty. Thanks for hosting this week!! I love crepes! I taught a class on them a couple of years ago, and it was so fun for us all to experiment with different fillings and rolling techniques. 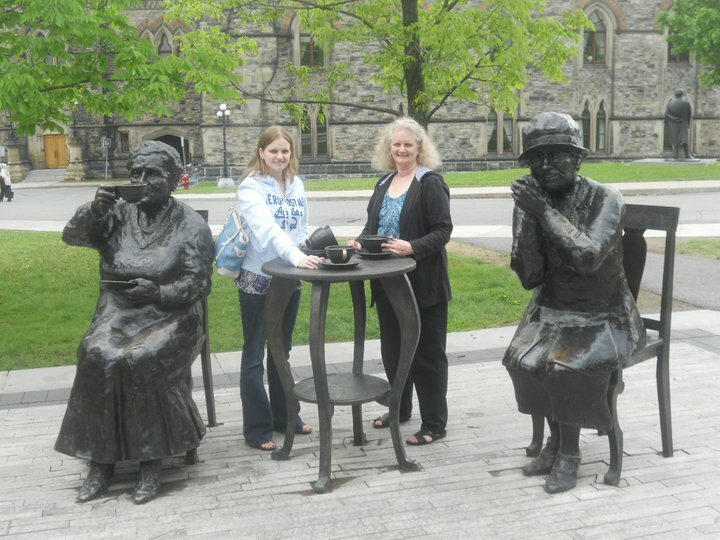 This was a great choice – they look beautiful! I have always wanted to make crepes. Yours look so perfect! You must have had a fancy home ec class to be learning about crepes! Amazing!! My mom made crepes from an old Fred Penner recipe, such good memories! 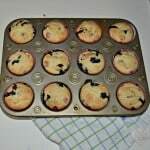 Love the blueberry peach combo and I enjoyed your post thinking way back to home ec. class. My daughter will be starting those classes soon and I am looking forward to living through her vicariously. Thanks so much for hosting too! And this is why home ec. classes should not disappear! I learned so many of the basics from my one class in jr. high. These crepes look awesome! Making crepes is so much fun! 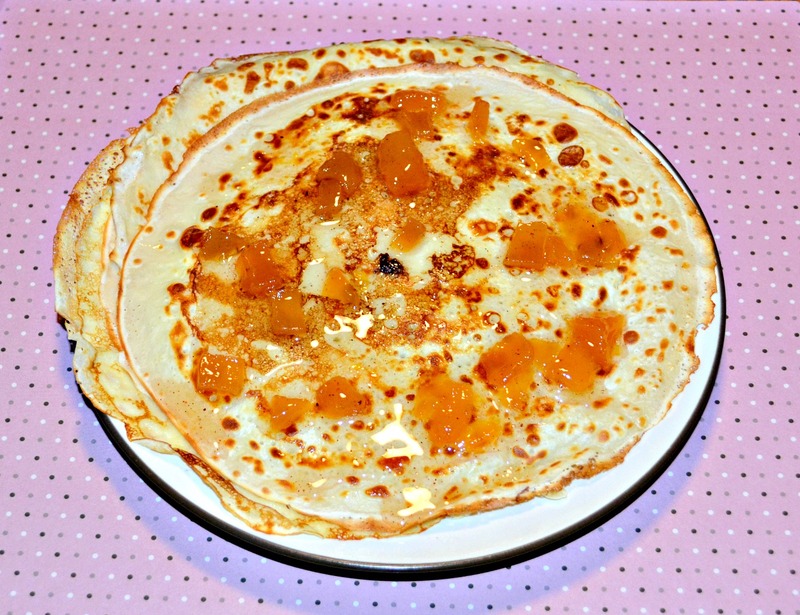 My husband and I made them awhile back, and we found out that making crepes was his secret talent 🙂 Your peach jam looks so good – I’ll have to try that next time we make our crepes! Your crepes look delicious! 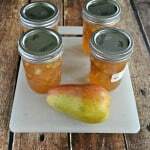 I love your filling of peach jam! Blueberries and whipped cream make such a beautiful topping! This is such a great recipe. I just love how pretty crepes are. Thanks for such a great event. Thank you so much for hosting #SundaySupper this week. You did such a great job! These crepes look absolutely delicious! That looks luscious! I haven’t mastered crepes yet, but I will try YOUR recipe! Great recipe for #SundaySupper, and thank you for hosting! Your crepes look fabulous. 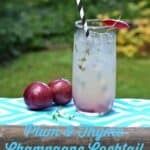 I have actually never attempted making some at home, but I really should!